The National Committees for Family Farming in Indonesia and Colombia have promoted processes of political dialogue between key players in Family Farming, leading to the approval of new regulations for the development of Family Farming in their respective countries. In Indonesia, the Law on the Protection and Empowerment of Farmers in central Java has been approved. 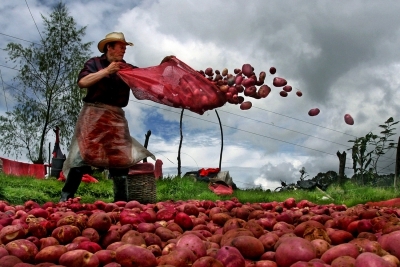 In Colombia, strategic public policy guidelines for Family Farming were approved. The Law on the Protection and Empowerment of Farmers is one of various national laws whose implementation at the provincial level is being promoted by the NCFF in Indonesia. The Governors Regulation (16/2018) for its enforcement in the Province of Central Java was signed last 26th February. Through its regional members (RCFFs - Regional Committees for Family Farming), the NCFF in Indonesia has been deeply involved in the formulation of policies through workshops, meetings, and discussions with other interested parties such as the Provincial Parliament and government officials. They supported consolidation and effective coordination between Family Farming organizations and civil society with the goal of promoting this law. This legislation addresses important issues such as: access to and use of land - guaranteeing the availability of land as one of the resources for small family farmers; infrastructures and installations - encouraging provincial authorities to facilitate the standardization of seeds and fertilizers (according to the National Standards of Indonesia); crop failure insurance - so that the government can allocate funds to subsidize small farmers who were unable to harvest; and generational succession - so that young generations of farmers will stay in the fields. “The Governor Regulation of the Protection and Empowerment for Farmers of Central Java is not the final endeavor of the RCFF of Central Java, but this achievement is a new chapter for us to monitor, and keep watcing the implementation of this regulation,” explained Syukur Fahrudin, the coordinator of the RCFF of Central Java. “The next big effort of the RCFF is then to search for and identify the various form of the implementation of the Governor Regulation”. In Colombia, the RENAF (National Network of Family Farming, equivalent to NCFF) intensively participated in the elaboration of strategic guidelines for public policies for Family Farming which were adopted last December 2017, through Resolution 464 of 2017. This resolution, along with its guidelines are the results of a process that started in 2014 with the Family Farming Program and which continued with the establishment of a working group composed of different actors involved in Family Farming (including RENAF). In 2017, the group worked tirelessly on the elaboration of the guidelines, relying on the participation of Family Farming organizations and entities from around the country who were able to make suggestions throughout various work sessions, regional meetings, and an International Family Farming and Peasant Economy Seminar. It should be emphasized that these guidelines were developed in the context of the implementation of the peace agreements in Colombia whose first objective is comprehensive rural reform. One of the notable points in this resolution pertains to responsible governance of land ownership, fisheries, and forests (article 4). It alludes to the advancement of rules, processes, and structures to define and regulate the way in which people, communities, and other subjects access national resources, ensuring, for example, more equitable access to land and more transparent and participative decision-making processes. On the African continent, various NCFFs are involved in the development of national political programs and are undertaking a key role in defending the interests of Family Farming. In Senegal, for example, the NCFF (through the GDPS, “Groupe de dialogue social et politique” Social and political dialogue group), presented competent authorities with the main proposals of agricultural organizations and civil society in general for the development of the National Investment Program (PNIASAN). The advocacy process has achieved its first results with the incorporation of the GDPS in the Technical Committee for the monitoring and implementation of PNIASAN. As for other NCFFs: in Burkina Faso they developed the document for the second phase of their National Rural Sector Program; in Madagascar they revised the Agricultural Development Fund; and in Gambia the NCFF is involved in the development of the National program for Agricultural Investment. All these are examples of regional advancements in the defense of Family Farming. These processes are examples of the important work of political advocacy carried out by the NCFFs. They point toward important advancements for the consolidation of support for Family Farming in their countries and regions, emphasizing fundamental aspects such as access to the land and other natural resources. The Decade for Family Farming 2019-2028 offers a unique opportunity to further their work. This news is cross-posted from the IYFF+10 website.